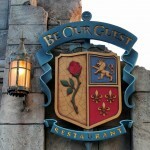 Be Our Guest Restaurant in Disney World’s Magic Kingdom was an overnight sensation, and has stayed at the top of every Disney fans’ must-get-a-reservation list. The crazy to get a table has reached epic proportions and has resulted in an unprecedented move: this counter-service-at-lunch spot now offers Advance Dining Reservations. 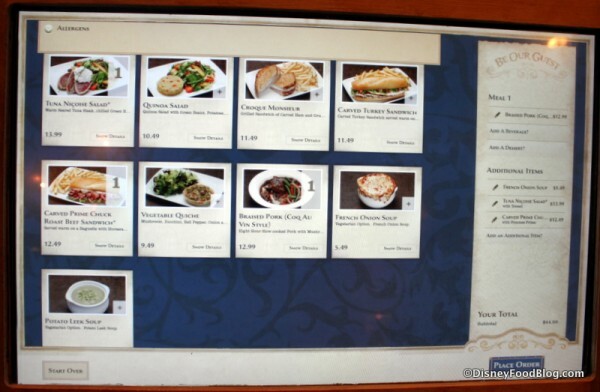 (Previously, Be Our Guest tested lunch Fast Passes. See more information on the move to ADRs here.) Dinner, which continues to be table service, also requires ADRs just as soon as your 180-day window opens. 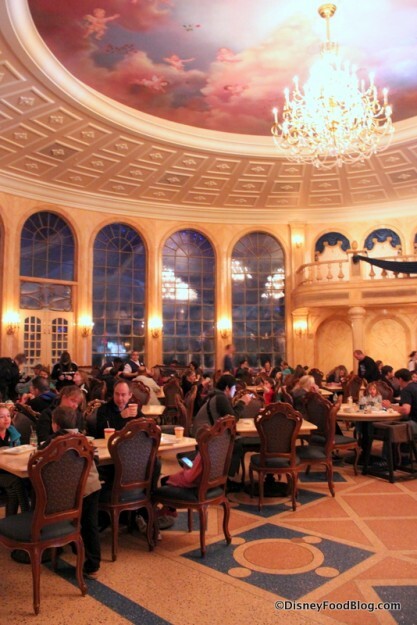 And now, after hearing rumors forever, Be Our Guest just started testing Breakfast Service. We had a chance to try it for ourselves the very first morning it was served! I’ve enjoyed all three meals here. 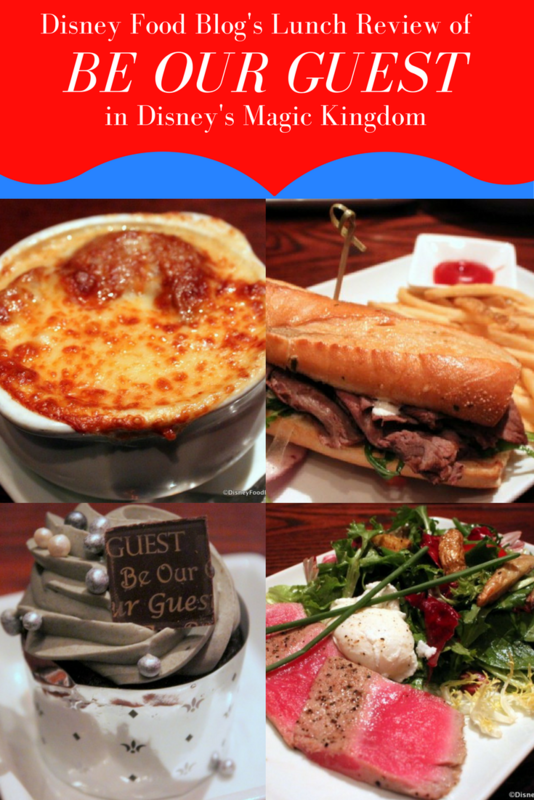 The food has been good to great, and the impeccable themeing make this a must-do experience at least once. But I never like to assume a place continues to be awesome — especially a spot as busy as this. It’s very easy for busy restaurants to nose dive in the quality department, and to trade on their fame alone. And so, it’s become pretty important to me to check in with Be Our Guest periodically to see if I’d still recommend that you fight the good fight to get a table here. And that’s just what I did on a recent lunch visit. Be Our Guest has taken a hybrid approach to service since day one. While dinner is a table service meal, lunch continues to be…not so much counter service, as upscale quick service. But now there’s officially a twist to lunch — you can (and totally, totally should) book an Advance Dining Reservation (ADR for short). So you’ll check in for lunch much the same as you do for dinner. My, how things have changed. 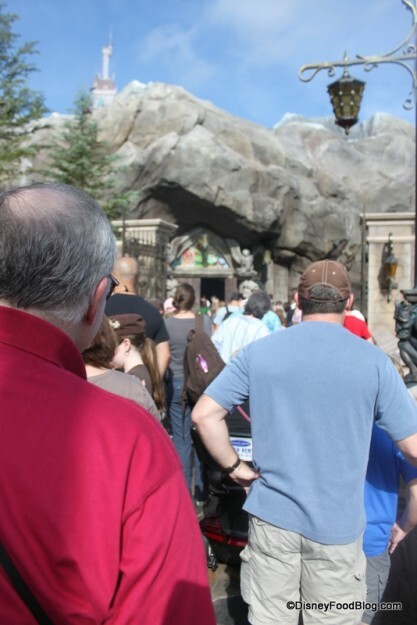 Thanks to ADRs (and the fact that standby waiting often isn’t even available), the routinely crazy-long line for lunch doesn’t start up at the crack of 10AM anymore. Wanna see what I mean? Here’s a view from the pre-ADR lunch days. Yikes! But don’t get any ideas that you’re just going to stroll in for a quick look-see. 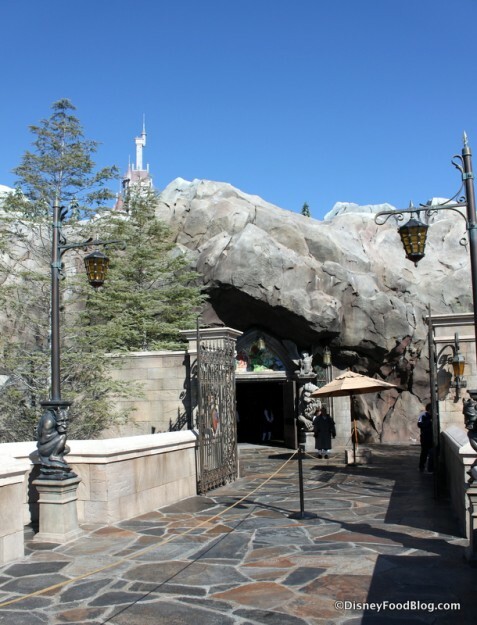 Nearly the only ticket that will gain you access to Beast’s Castle is an ADR. Once you’re through the entrance (woo! You made it! ), be sure to take in every detail. Be Our Guest is truly a gem, and a stunning example of Disney’s ability to imagine and bring to real life the animated worlds that they’ve created. To your left, you can see just what I mean. 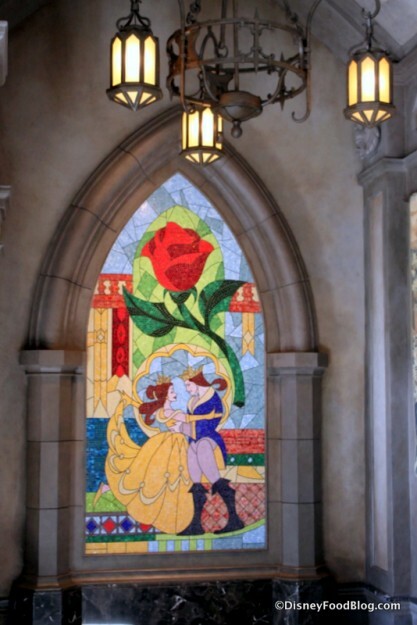 Fans of the film will remember the backstory of Beauty and the Beast at the beginning of the film, told through a series of stained glass windows. 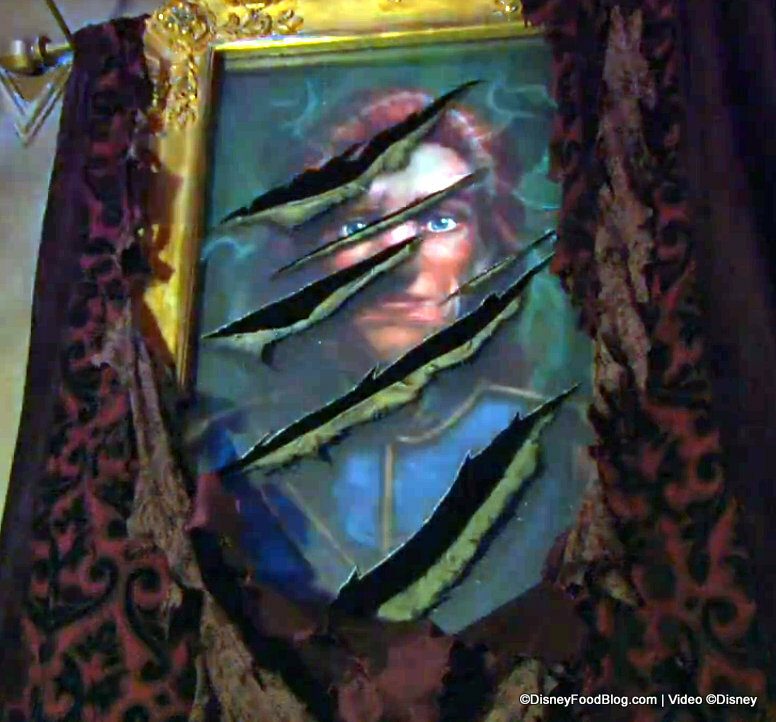 And in the final scenes of the film, a new window is shown — with Belle and her Prince. 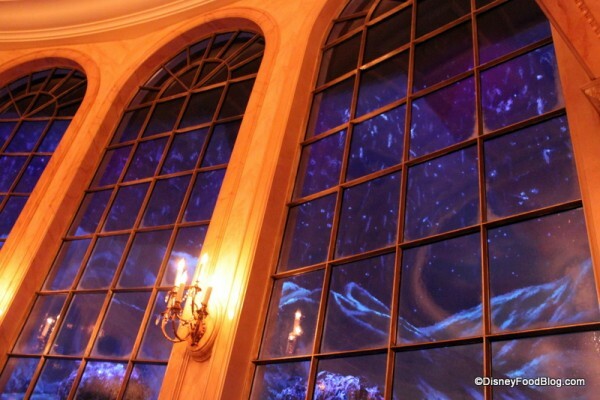 You’ll find the scene immortalized in a mosaic at Be Our Guest. But to get your lunch party started, you’ll actually head to your right, down the Gallery. 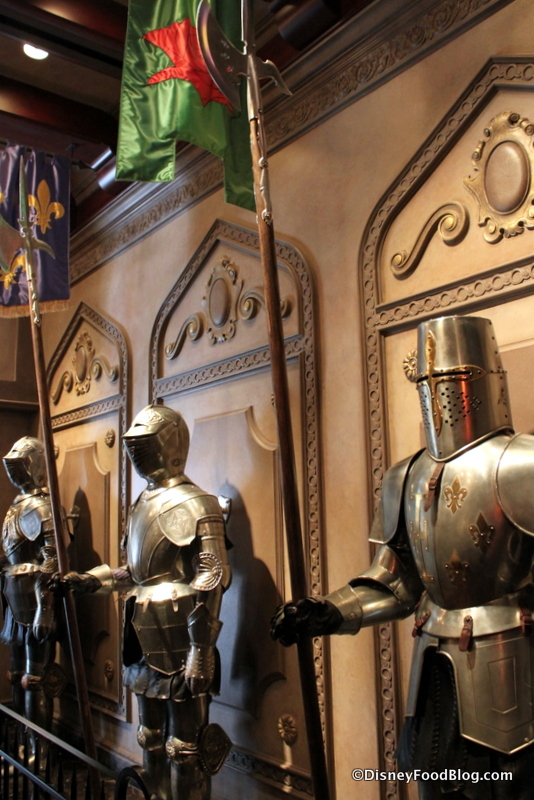 The narrow passageway is lined with shining suits of armor standing at attention — and it’s one of my favorite spots in the restaurant. These Enchanted Suits of Armour whisper, crack jokes, and generally just have a good time. I’m going to take you a little out of the normal DFB sequence here so that we keep the order of how things work at Be Our Guest. Once you leave the Gallery, you enter the ordering area. And this is why I don’t call Be Our Guest a counter service spot. Here, you can see to the right the Digital Menu Boards that feature lunch items. And directly ahead, there are kiosks. 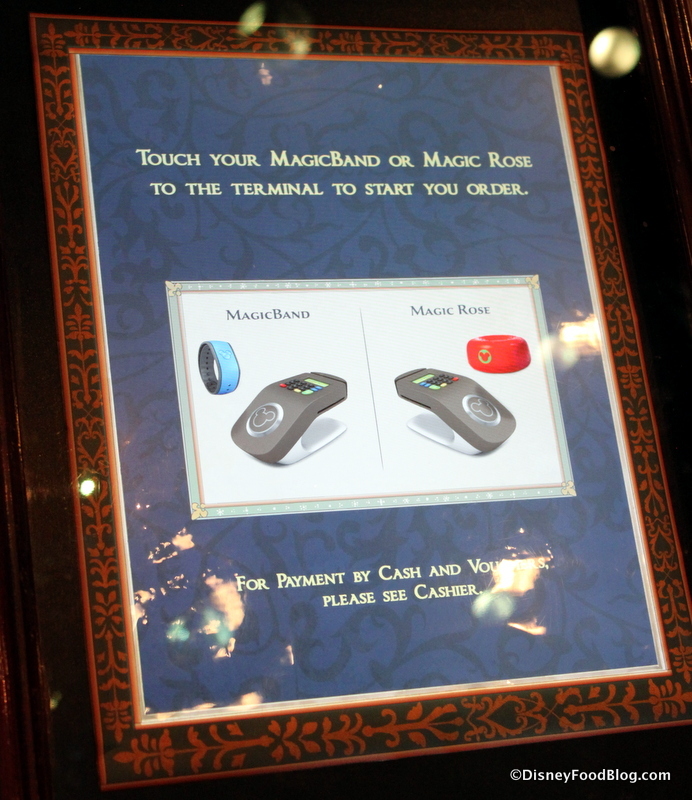 Some are manned with Cast Members who can take your order, and others are available for guests to enter their information directly. I chose the self serve option. From there, the detailed menu took me through each stage of ordering. Here are the adult options. A “1” over the item indicates that it is part of our order. Because I had a FastPass to dine at Be Our Guest (this was before the restaurant changed to ADRs), I pre-ordered, making the ordering process slightly faster once I got there. It was just a matter of confirming our choices. And here’s a screen which shows you Kids’ Meal options. We had pre-selected a meal for the child in our party as well. An additional pop-up menu for the Kids’ Meal gave us the opportunity to change up any beverages or side dishes. It’s at this point that you pay. Once payment is taken care of, you either receive a Rose if you’re not using a MagicBand, or your MagicBand acts as your party’s locator. 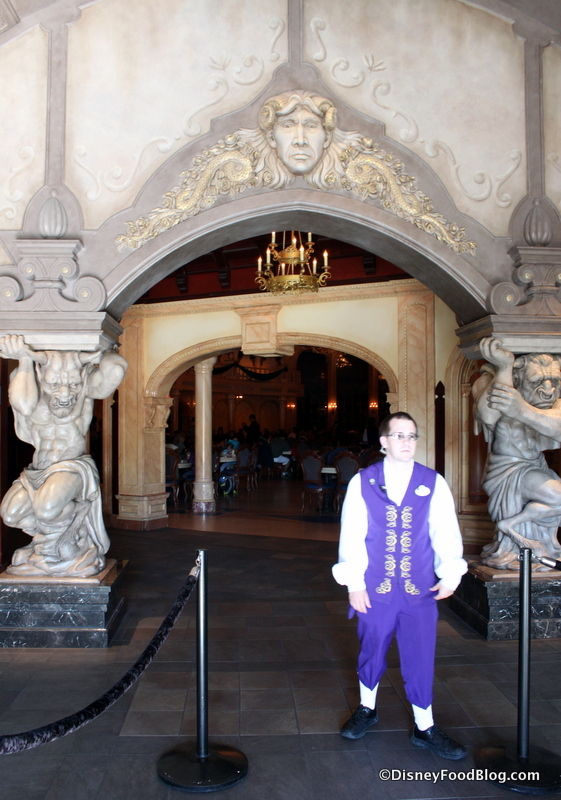 Cast Members kindly instruct you to find a table and have a seat, so that your food can “find” you. For the busy lunch hour, there are three main dining rooms open. Let’s take a quick look around the largest one, the Ballroom. 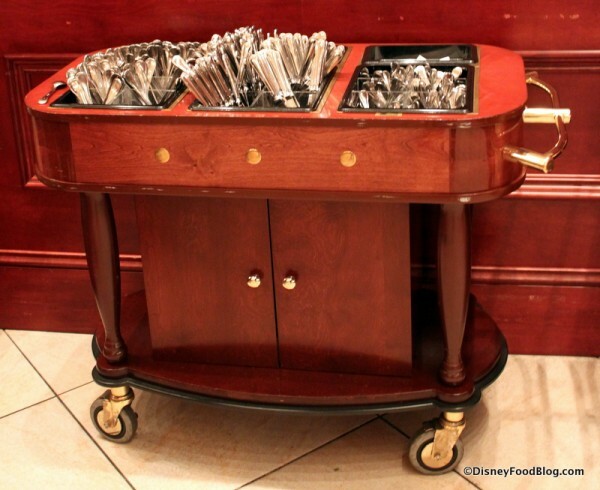 As you enter, Silverware Carts are stationed to each side, so that you can help yourself to the utensils you’ll need. Note that you enjoy real silverware at Be Our Guest! It sounds like a little thing, but anytime I can cut my meat with a real knife instead of a plastic one, it’s a good day! On the side of the expansive space, there are Self-Serve Drink Dispensers, which are nicely fancied up, befitting their palatial setting. Once again, the themeing here is pitch-perfect. If you’ve ever seen the film, you’ll be blown away by the surroundings. Since we’re eating and not dancing, you do find tables here ;-). Tabletops are durable yet elegant, and chairs are substantially padded. This is where the lunch crowd definitely benefits from the dinner table service setting. While you await your food, if you’re sitting in the Ballroom, be sure to take in the details, like the Ceiling and the large Arched Windows at the front of the room. Those babies? Yep, they’re real people. The cherubs depict the children of the imagineers (and some imagineers themselves!) who worked on the project. Peek out on the nighttime garden scene, and you’ll glimpse gently falling snow. The animation here is the same as it is in the film! There are also two other areas to choose from. I’ve enjoyed sitting in the incredibly popular West Wing many times. It can be hard to find a seat in here, especially if you’d like to sit near the Enchanted Rose or the Portrait that changes from the Prince to the Beast. Remember that the West Wing is under attack by a constant thunderstorm, and the lightning and thunder can get pretty realistic if you have a little one in your party. You can also choose to sit in the Rose Gallery. When the restaurant first opened, this area was available to accommodate larger lunch crowds, but was normally closed for dinner. With Be Our Guest’s continuing popularity, the dining room is now often available for dinner seating as well. 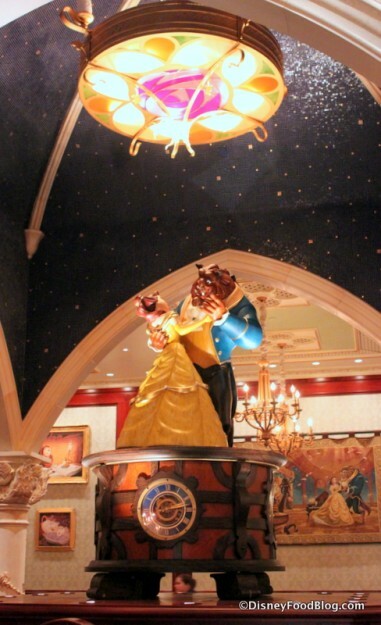 Once again, seating here is comfortable, and is centered around the room’s main focal point — a life-size, revolving Music Box, depicting Belle and Beast dancing. The piece is a gift to the couple from Belle’s father, Maurice, given to them on the occasion of their wedding. 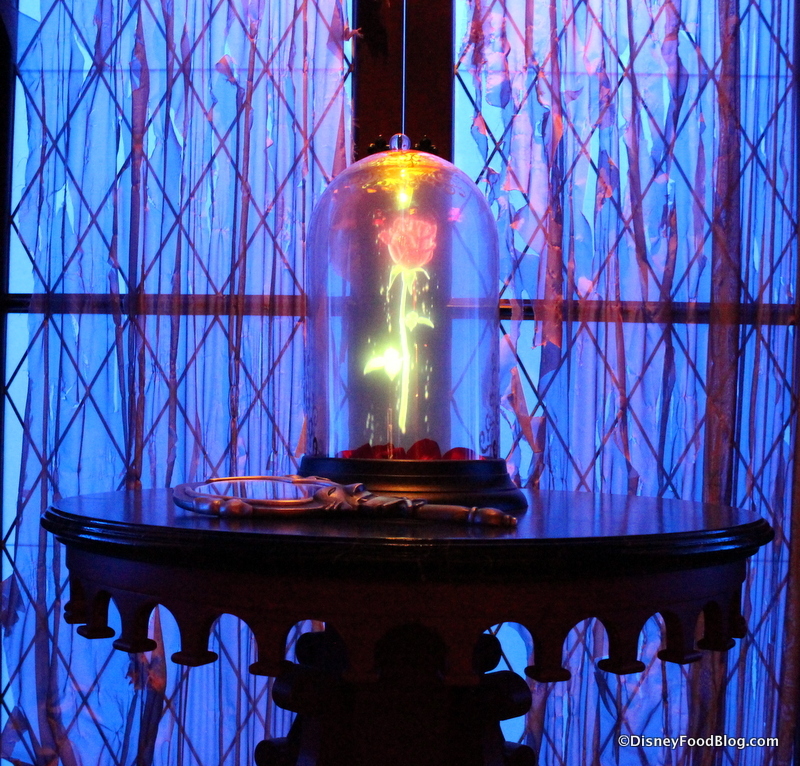 While the Rose Gallery isn’t a room that’s taken directly from the film, it’s still a charming space. 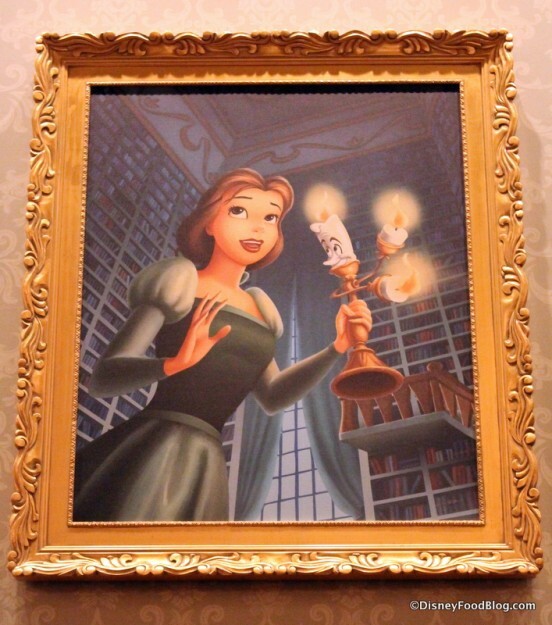 In addition to the music box, walls are lined with portraits of the film’s characters. Many are depicted in scenes not found in the movie, so it’s fun to take a moment and check out each one. Faster than you might expect, your food will magically find you, and it will be time to dig in! Let’s take a look at the dishes our party enjoyed during this visit. 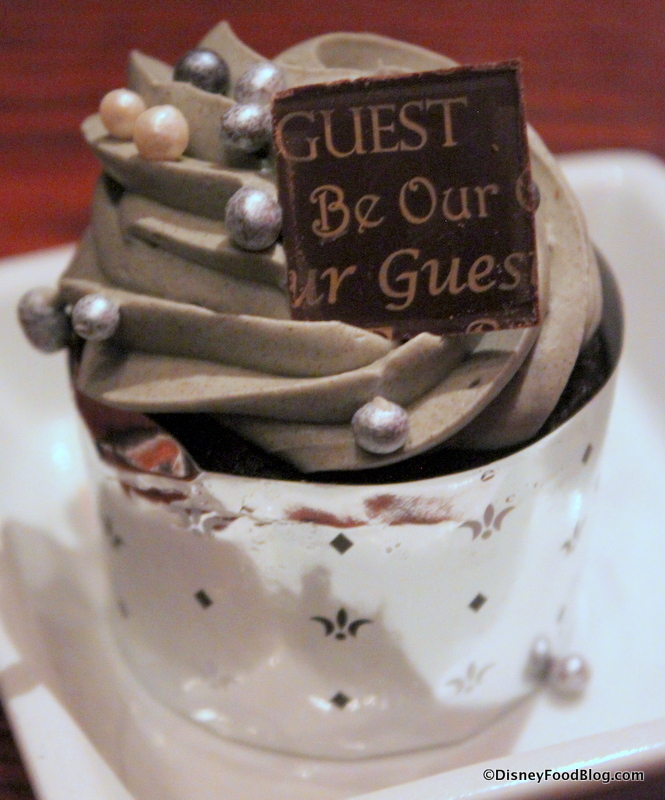 Even though I’ve experienced it a number of times, I still find Be Our Guest’s delivery at lunch to be a charming experience. 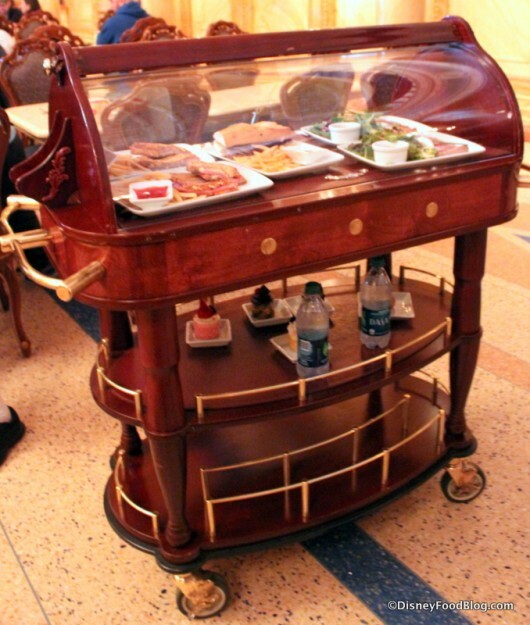 Throughout each dining area, busy servers are constantly wheeling these large, beautiful Trolleys, containing guests’ food. When ours arrived, you can see that we had our hands full sorting everything out! Let’s take each dish one at a time to give them each their due. 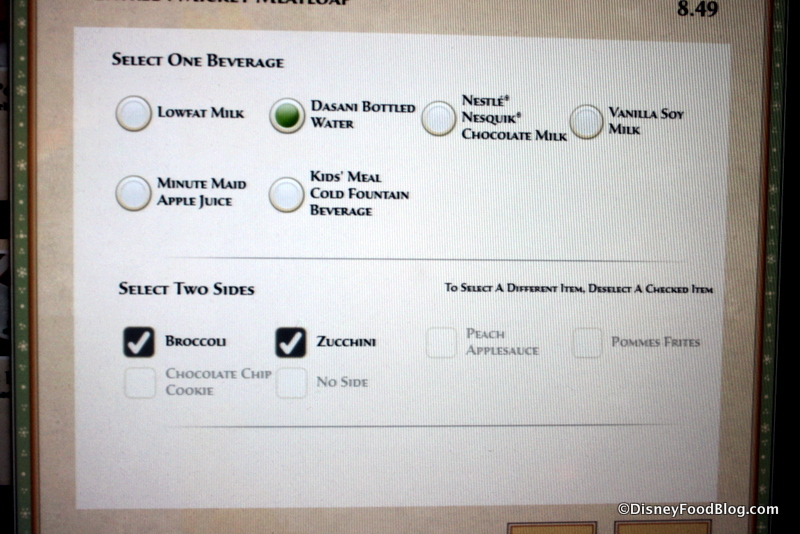 I’ve sampled both soups at Be Our Guest — the Potato Leek Soup is packed with flavor, and remains one of my favorites. But I opted for the other choice on this visit — the French Onion Soup. The soup is picture perfect, but it is a bit lighter than other versions I’ve had. I mean, it’s still covered with that rich crust of bubbly cheese, but this version is vegetarian. The broth isn’t beef-based as is traditionally the case, so the flavor is a little lighter than you might expect. That said, it’s quite good. 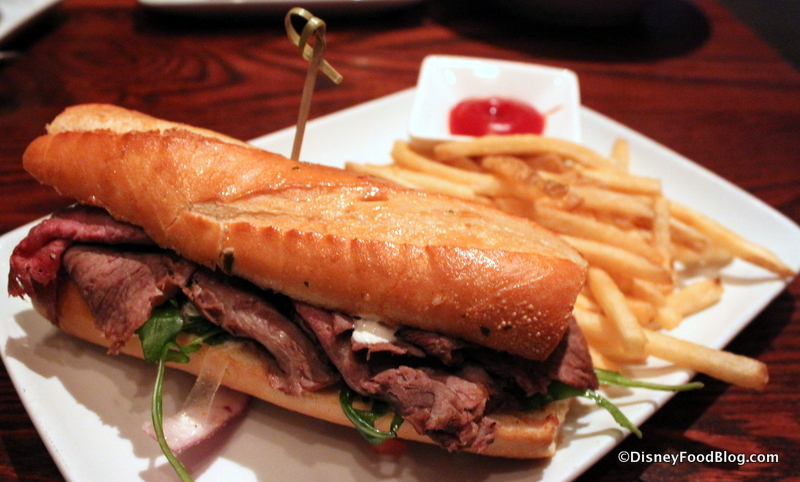 It had been a while since I had enjoyed the Carved Prime Chuck Roast Beef Sandwich, so I decided to try it this time. 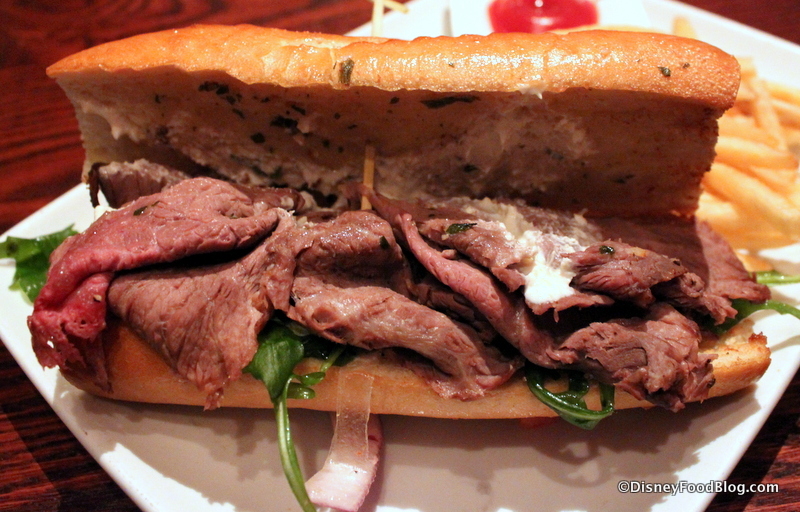 (This sandwich changes on the menu regularly, from a steak sandwich back to roast beef.) Piled high with thinly sliced Roast Beef, the sandwich is served warm on a Crusty Baguette with a side of Pommes Frites. Lift the bun, and you’ll spy some Horseradish Cream and a generous bed of Arugula. 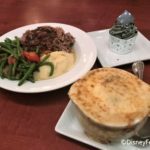 (Disney Chefs love this stuff.) The flavors all work beautifully together on this large sandwich, although a little extra Horseradish Cream wouldn’t hurt. 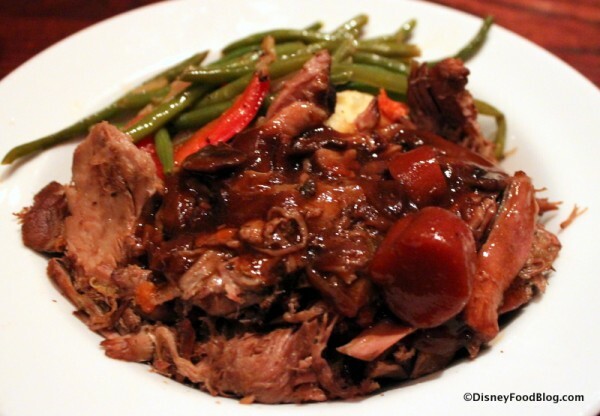 One of my favorite dishes (probably my all-time favorite) at Be Our Guest lunch is the Braised Pork. I am still in awe that you can get a dish like this at lunch time! The meat is rich, tender, and perfectly seasoned. The Mashed Potatoes underneath are a well seasoned accompaniment, and snappy (not at all limp) Green Beans are a delicious way to get a serving of veggies. It’s been perfect every time I’ve enjoyed it. 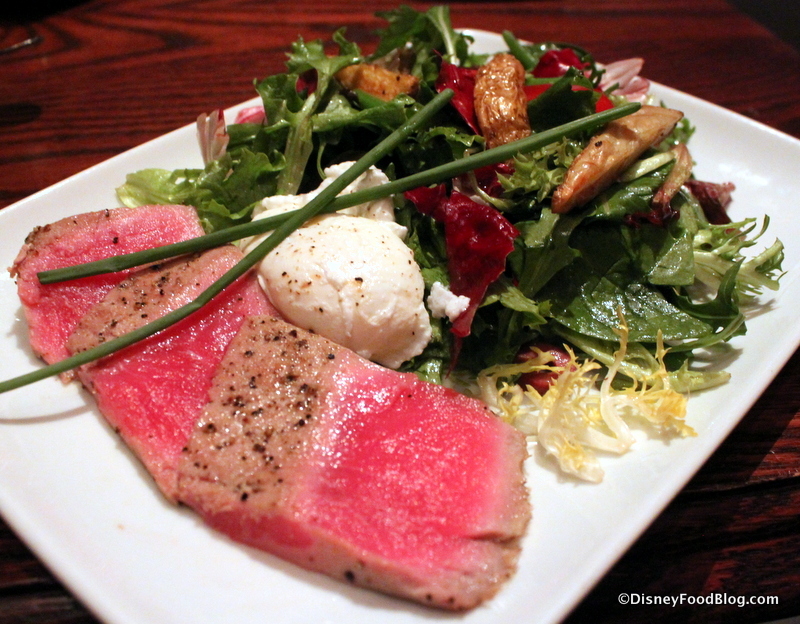 Something new for me was the Tuna Niçoise Salad. This is a gorgeous dish, with all of the traditional components on hand. The Seared Tuna, Hard Poached Eggs, Fingerling Potatoes, and Olives atop a bed of Spring Mix make this salad something hearty and special. I’ll still get that Braised Pork every time, but I’m glad they have this lighter option on the menu. The tuna wasn’t fishy, and the searing offered good flavor. We also ordered the Vegetable Quiche, served with a lightly dressed Side Salad. 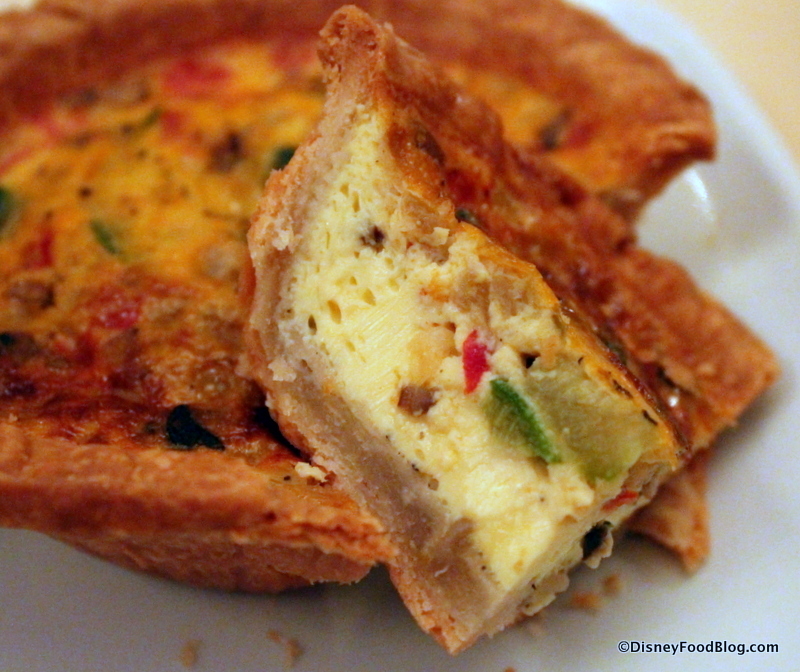 The Quiche is a flavorful mix of Mushroom, Zucchini, Bell Pepper, Onion, and Chive. It’s a decent, French-inspired meatless dish. Note — if it sounds good to you, you can also enjoy it right now as a breakfast option. 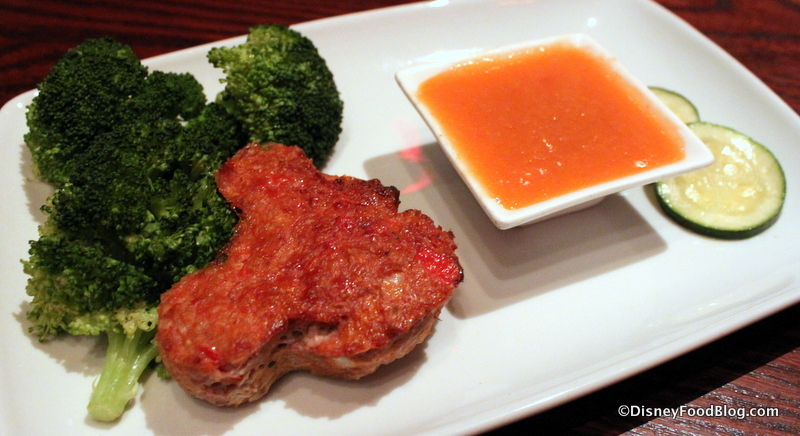 Finally, the littlest member of our crew went for the Mickey Turkey Meatloaf, which was served with Zucchini, Broccoli, and Peach Applesauce. Since we ordered it with all the Mickey Check recommendations, it qualified as a Mickey Check Meal. This was…cute. But the flavor was less than spectacular. While I reeeeeeallly appreciate Disney’s commitment to healthier food, I think they need to keep working on flavor. Because truly, healthy and delicious can exist on the same plate. But they aren’t there yet, in my opinion. 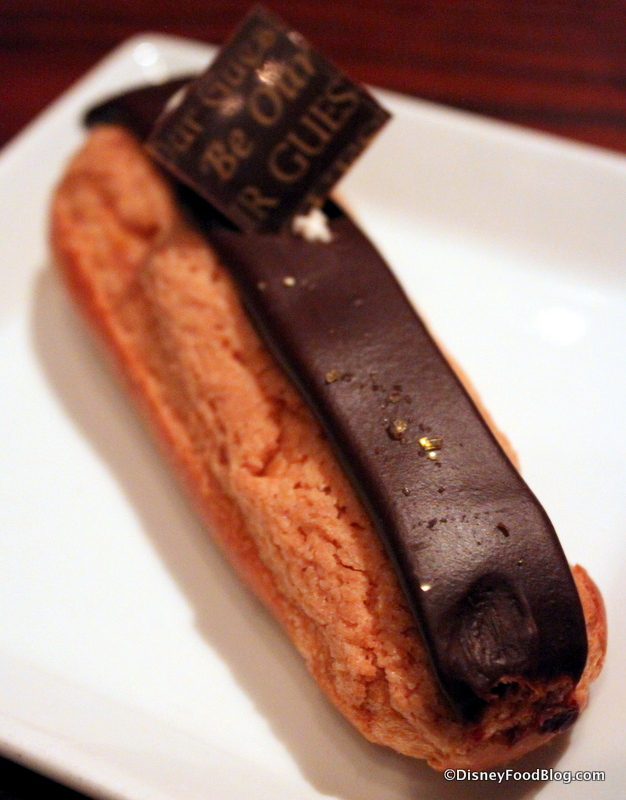 Our table also decided to sample many of Be Our Guest’s lunch dessert options — all of which are single-serving pastries. We started with one of my favorites — the Master’s Cupcake. 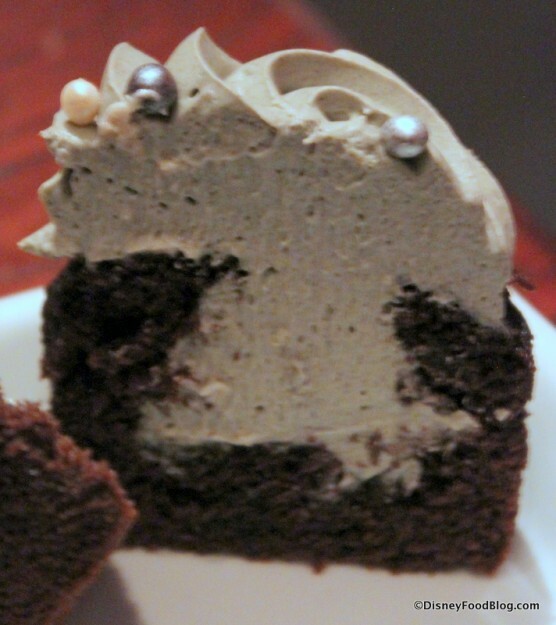 Chocolate Sponge Cake is topped and filled with the Grey Stuff — a Cookies and Cream Panna Cotta Mousse. The cupcake itself is on the small side — or rather, it’s regular-sized, and not the jumbo versions you see out and about in the Parks. I like the cake to fillng ratio here. And who are we kidding? It’s just super awesome to go to Be Our Guest and eat Grey Stuff. 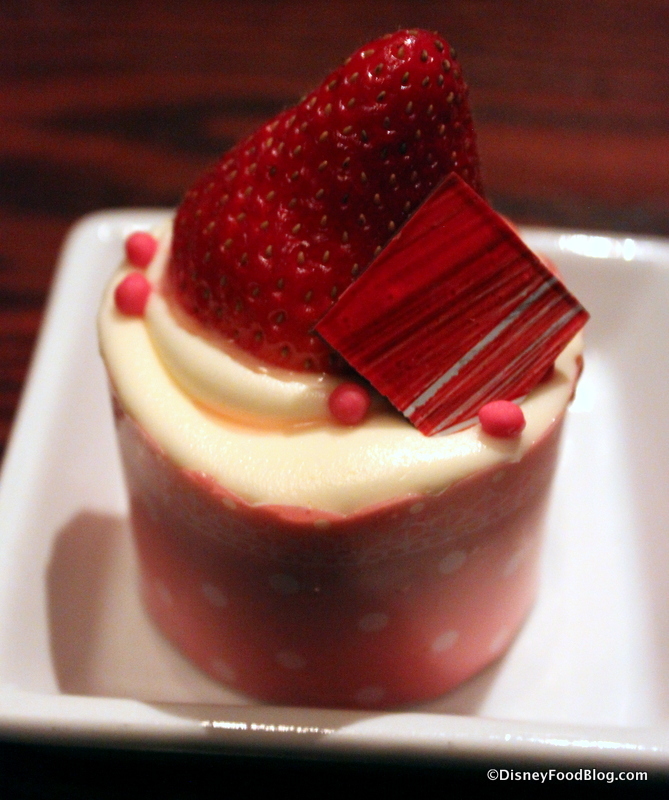 We also went for the Strawberry Cream Cheese Cupcake, another one of my very favorites. 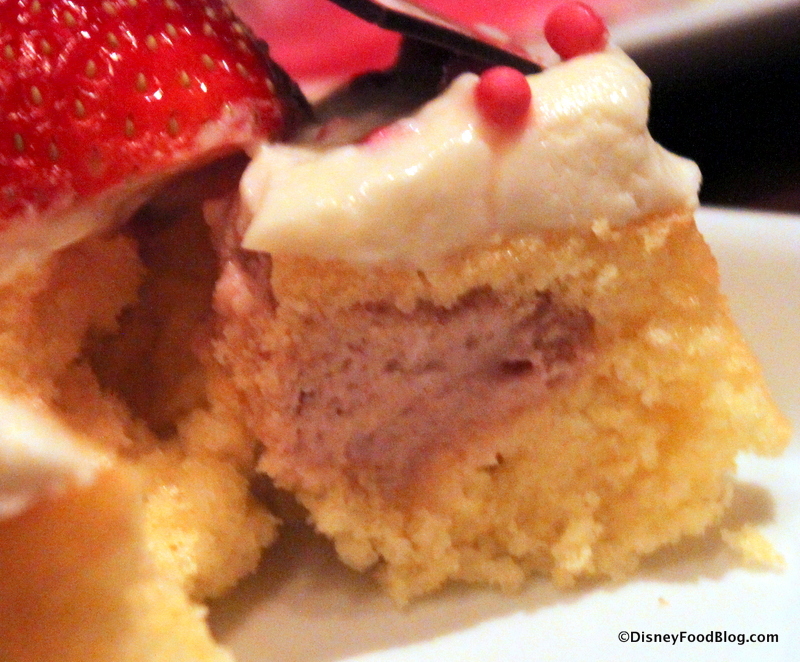 Vanilla Sponge encases Strawberry Mousse, and Cream Cheese Icing tops this one. While I would have enjoyed a little more filling, this one was delicious, too. 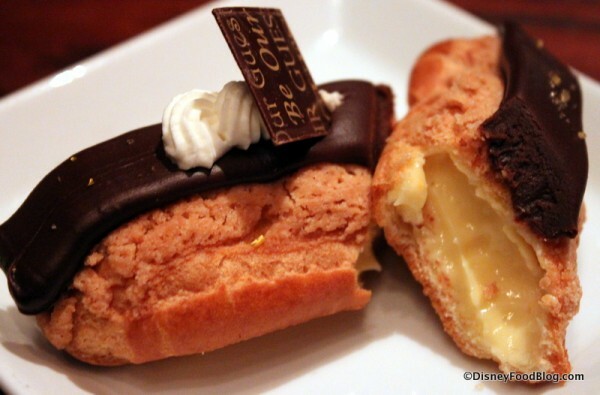 Finally, we tried the new Eclair a l’Orange. I’m a huge fan of the flavor combo of Chocolate and Orange, and I thought this was a great addition to the dessert menu. 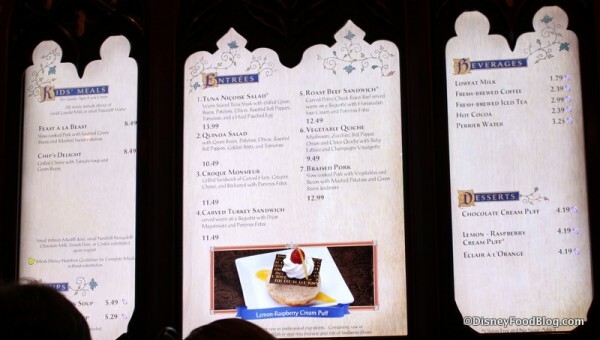 It was a little on the small side (as is the case with all of the Be Our Guest desserts), but it’s jam-packed with Orange-Flavored Custard, which was something everyone really appreciated and enjoyed. Okay, so we totally needed a nap after that meal. 😉 But it was so worth it. 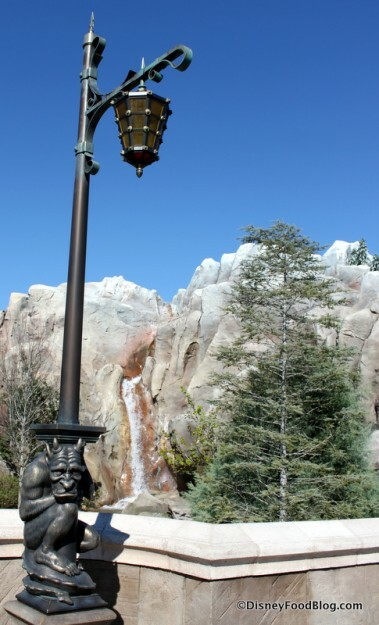 Be Our Guest continues to be strong. This place is really something special. We all know — they serve thousands of guests in the space of a week. But every time I’ve visited, the service has been friendly, helpful, and efficient. And the food has been consistently delicious. Part of me would love to tell you not to bother with the hassle of Be Our Guest. After all, it’s no small feat to snag an Advance Dining Reservation here for Lunch or Dinner (though breakfast seems to be a bit more open). But the truth is, I think you do need to eat here. Sure, the atmosphere is spectacular. But it’s so much more than this. This is really terrific food, especially at lunch. In fact, if you aren’t on the Disney Dining Plan, splurge on a big lunch here, and eat lightly for breakfast and dinner. It’s the French way, and you may just save a buck or two. 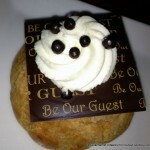 If you haven’t been to Be Our Guest, I encourage you to try it. And if you’re wondering if you should bother with a second (or third or fourth) visit, my answer is…probably yes. 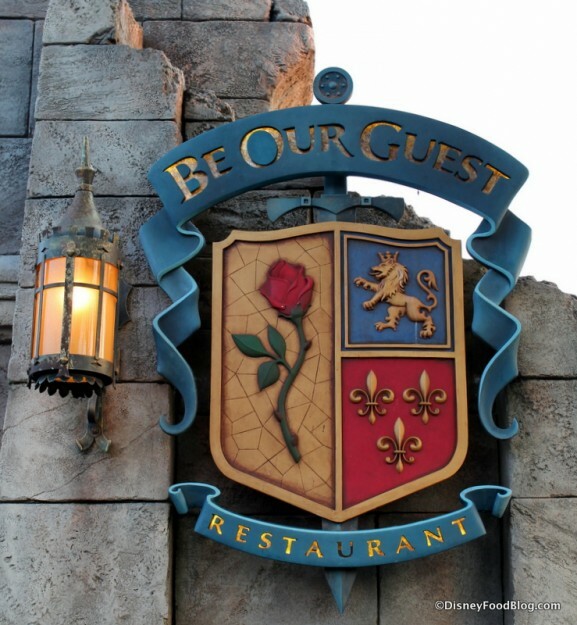 Have you enjoyed Breakfast, Lunch, or Dinner at Be Our Guest? Tell us what you think of this super popular restaurant in comments below! I LOVE BE OUR GUEST. I honestly dont think theres a better value for a “counter service meal” and when I was there for lunch the food was fantastic. The tuna nicoise salad is so unique and fresh plus its a great break from the heat even it does get crowded. In my opinion the lunch is a much better value than dinner and breakfast also looks wonderful. I’ve had lunch at Be Our Guest twice, had the tuna Niçoise salad and the turkey sandwich and also sampled my husband’s pork shank. Everything was delicious; I have no complaints whatsoever about the food. But finding a table was a nightmare. First time we wandered all three dining rooms several times before finally finding a messy, unbussed table, sitting there, and flagging down the first busser who happened by. Second time we happened upon a messy table in the process of being bussed in the first dining room we checked and grabbed it. Both times we waited and waited and waited until our food finally arrived, which took MUCH longer than we expected. I don’t care how good the food is, the hassle of eating here isn’t worth it. 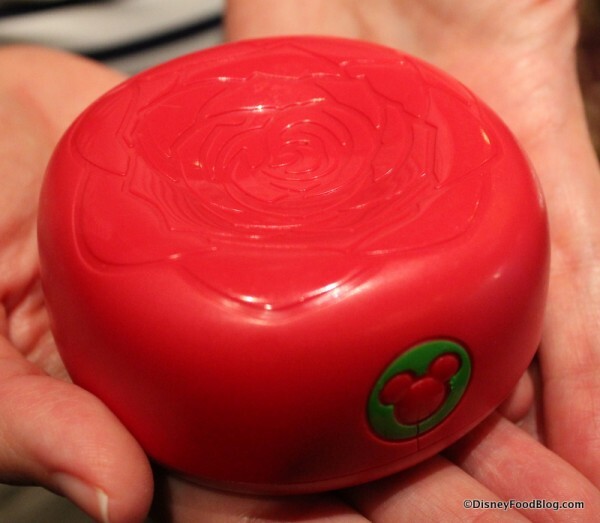 Does the move to ADRs now mean that the ability to pre-order via My Disney Experience that was available when lunch was a Fastpass is no longer an option? Would be a shame if that’s the case as it was a great time saver. 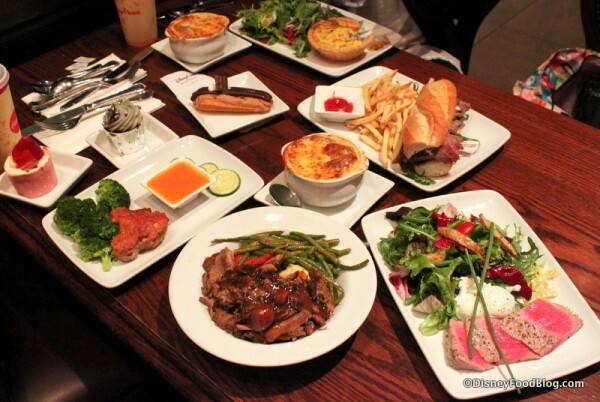 We will be on the deluxe dining plan…Would you suggest lunch over dinner, even in the case of the DxDP? For us, the dining plan is less about value than it is about the convenience of having everything prepaid in advance and not being limited. But even so, it feels wasteful to use a table service credit for a counter service meal. This does NOT look like counter service food, though! Hoping we’re able to snag a reservation. Last December, even booking the first possible day (for a trip staying onsite!) we weren’t able to get in. Almost everything looks wonderful. But I have to put on my cranky hat and say that two thin slices of zucchini is a garnish, not a side! The food at lunch and dinner is excellent but, if I had a deluxe dining plan, I would not waste it on lunch. I would definitely use it for dinner. There is a totally different feel to the restaurant at dinner time. Not to mention, you get waited on. The food is also different at dinner and it is amazing! However, if that pork up there caught your eye, it is available at dinner as well. Check out the dinner menu and you will see what I mean. The ambiance at dinner can’t be beat. Sadie….I think it would just depend on the atmosphere you want. I have been there twice for lunch. 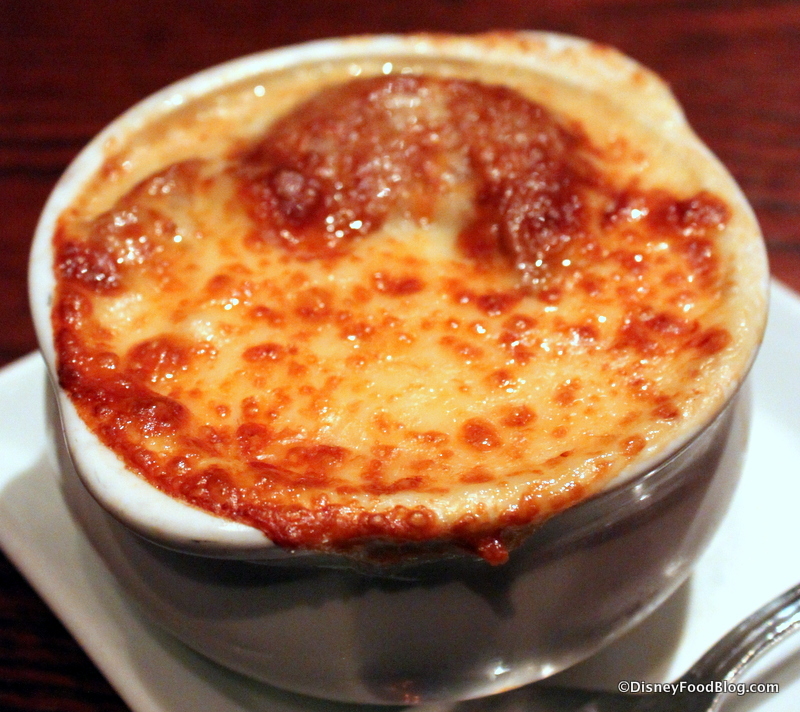 Both times having the French Onion Soup and the Braised Pork. Both are amazing but I can’t see spending twice the money for the same food just for a table cloth. That way you could see the castle, try the food and still have a dinner credit to use later. In any case, have a wonderful time and know I am jealous not to be there. I have to agree with Jan. I enjoyed the food at lunch when I ate here, but it was a TOTAL HASSLE. I was there when it was not at all peak season, had a 45-minute wait in line to order with a reservation at 2 PM – not exactly peak lunch time, and could not find a seat. I wandered around all over the place. The food service was good and the atmosphere was great, but it was not worth the hassle for lunch. I will try dinner if I can get a reservation. Basically, I was glad I did it once, but I wouldn’t do lunch again. The atmosphere is great, but now that I’ve seen that, I’d rather go over to Columbia Harbour House for quick service, or better yet, sit down at the Plaza or go over to the GF Cafe or The Wave and stay out of the chaos. Can you get that steak baguette without the horseradish if using the electronic ordering? It looks lovely but I can’t stand horseradish! We are heading to Disneyworld in August and we have both lunch and dinner reservations at BOG for our last day. I’m hoping to score an ADR for breakfast too as soon as they open up. If we’re super lucky we’ll get to dine in each room that day! I am uber excited! I ordered the roast beef sandwich last time (Dec) and it was delicious. Although it also contained, undisclosed by Disney (or by this review, so maybe it was a mistake) a generous helping of red onions. I despise onions. I scraped them off and salvaged the sandwich…but if I wasn’t so even tempered, this would have majorly ruined my lunch. Unlimited soda refills are the bee’s knees though. Oh, it’s a great place for lunch. I like the roast beef sandwich as well. They do a real good job with their deli slicing. If you ask when it’s delivered they can bring some more horseradish… but it takes a while. Not having a waiter to bring you things or being able to ask a cashier or person at the window to please toss a little extra horseradish or something on a sandwich is one of the downsides of this kind of service. I was less impressed than you are with the Tuna Niçoise Salad. Mine, unfortunately, tasted a little fishy and that wasn’t a good sign. The salad portion was just as you said, and excellent. I’ve always managed to sit in the West Wing. I find the main ballroom hall to feel a little like a cafeteria with so many people in there and bustling around. 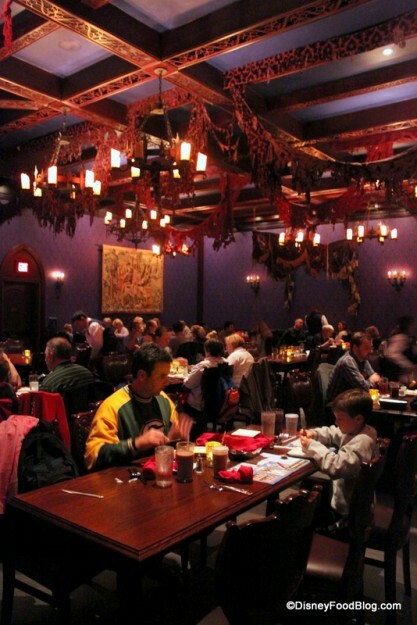 The Rose Room is very good for a comfortable, quiet, and formal feel. I had lunch here and we all LOVED it. I had the turkey sandwich and I could only eat half of it, it was so generous (they gave me a doggie bag). We all thought that the food was excellent. The desserts may be small, but they were more than enough after such a hearty lunch. I had the strawberry cupcake and it was delicious; next time I want to try the ‘grey stuff’! We sat in the ballroom and enjoyed every minute of our visit. 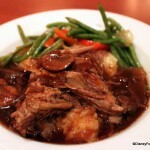 Does the braised pork have mushrooms? If so, are there a lot? Can I request no mushrooms? I am so torn. I really want to try this restaurant our next trip but we are taking all of our children to celebrate our adoption finally being done. That means we are a family of 9 plus a friend. Would we even be able to find a table to fit all of us at lunch time or should I just forget trying? We will always be a table of at least 7 even if my oldest two grown kids don’t go as the 5 we just adopted 8-3 yrs old. Why is George W Bush’s face on that arch way? Sam, I had to go and look at the archway to see what you meant. OMG! You are not kidding, it looks just like him! Eric, I don’t remember any mushrooms in the pork but I don’t think they’d be able to take them out because it is essentially stewed meat dish ladled over mashed potatoes with green beans on the side. I normally do not eat meat more than a few times a year (Thanksgiving turkey being one of them) but decided to try it for myself as so many people had raved about it. I found it flavorful but too salty for my personal taste (I use very little salt on food, so those who do not restrict salt may not have an issue with this). My husband was not overly impressed with the tuna salad; he likes his fish a smidge more done. He is a fan of the potato leek soup, however. He enjoyed the GF lemon puff as much as I like the strawberry cupcake and my son the chocolate cupcake. Not a big fan of the grey stuff as it just seems like sweet, Oreo-flavored fluff to me. Cheryl, there are lots of family and friend groups as large as yours. Tables in can be pushed together, not that they are all that far apart to begin with, so go ahead and reserve. Try for right at opening or during less busy hours. You’ll enjoy it. Thanks so much for your fast reply. We will go for it! 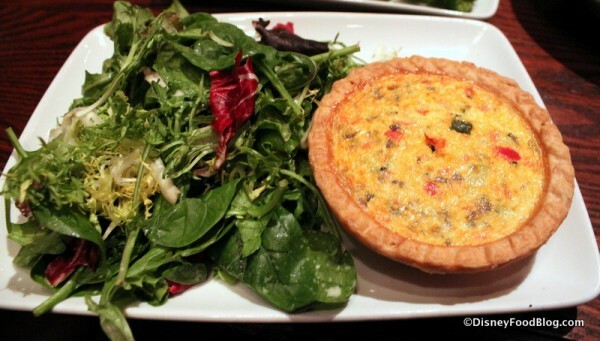 Can you order the quiche w/o mushrooms? or are they pre-prepped? @Angelina – I’m not sure what the rule is now, but in October I was unable to get it w/o mushrooms. We were lucky enough to get an ADR some months back for lunch and ate there yesterday. We hadn’t pre-ordered online as we weren’t sure how hungry we would be after our dinner buffet the night before. 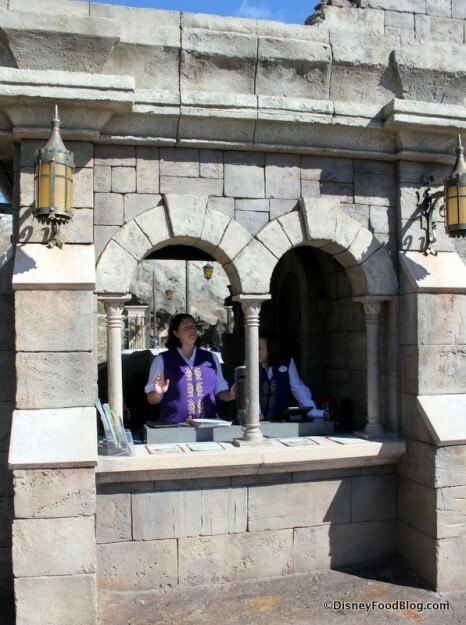 What I wasn’t aware of, however, was there was a very slow line waiting on the bridge, in full, very hot sun to enter the castle to order food. We were quite uncomfortable standing there and I wished we had just ordered any thing in advance to be out of the line. Upon entering the castle, it was very loud with people jammed everywhere and we were directed forward to order via a human and then ushered into the ballroom. But, we couldn’t see the knight’s room at all and I was disappointed in that. I tried to enter the knight’s area when we were leaving the restaurant and I was told very clearly that was not permitted and directed to the exit instead. We loved seeing the wonderful decor. The ballroom was too loud to dine in comfortably for us. It was full of little Belle princesses and their families 🙂 The Beast’s room was great to see but had no seating and it, too was a bit loud. 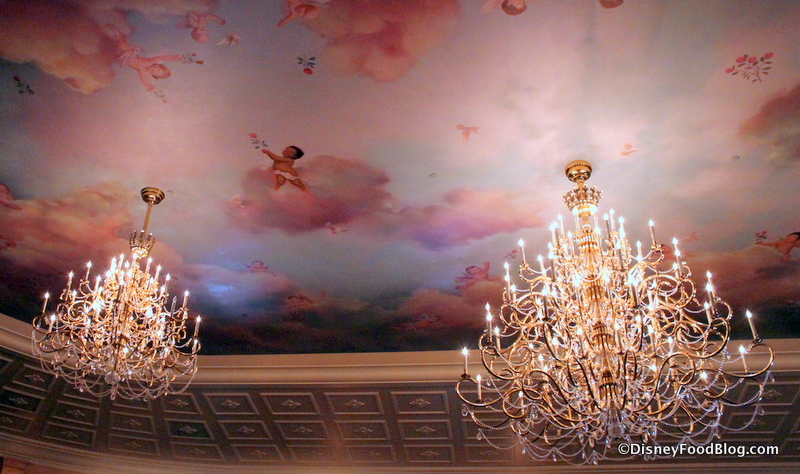 We sat in a relatively quiet spot near the Music Box room and enjoyed the room. There were always some empty seats in the room while we were there for our 12:05 reservation time. Our food was fine. My Croque Monsieur and fries were cool and a bit soggy but I liked the cheese flavor.The waitress also brought me a small mix of greens to add to my sandwich when I asked about how the sandwich was supposed to come (we didn’t get to see pictures when we ordered like on the touch screen). My son’s roast beef was apparently heard by our human order-taker as vege quiche, but a manager corrected it as promptly as was reasonable. He said it tasted fine but was nothing special. My husband’s Nicoise Salad was also fine with enough dressing, if a bit uneventful in the flavor department. Would we eat here again? Yes, with the caveat of advanced reservations and advanced ordering! It’s all part of the Disney Experience. We have ADR for BOG QS lunch. We have the QS Dining plan. As I understand it, each QS meal includes an entree, drink & dessert. I am confused about ordering soup. 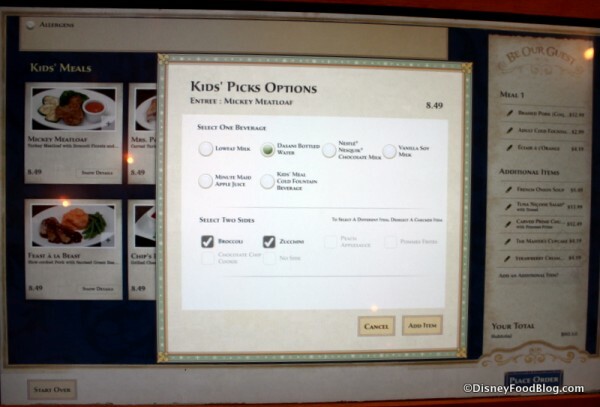 Is soup considered as part of the entree & included with the QS dining plan meal? Thanks for any help. SO here is a question that I hope can get answered. Under the new rules for the dining plan where you can replace a dessert with a snack. Can I get one of the soups instead of a dessert? Just had lunch at BOG January 29th and was told that I could NOT sub a dessert for a soup. I could sub a drink for another dessert, though. I wish I had done that as they had many dessert choices and they were kind of small servings. Hope that helps! Which ride is closest to the BOG restaurant? I’m trying to plan out when we need to leave certain rides to make our reservation and don’t see the restaurant on any maps. Also, if we have a 4:05 reservation, how far in advance should we arrive? We will be on Deluxe dining for our up coming trip. We have loved the freedom of this plan in the past. My question is…will my deluxe plan offer an appetizer at BOG lunch? We have not used this plan there in the past. 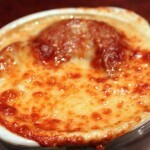 Does anyone know how much soup is in the French Onion Soup for lunch? Is it small enough that I should consider it an appetizer? Would like to know before I make my dining choices for my trip. 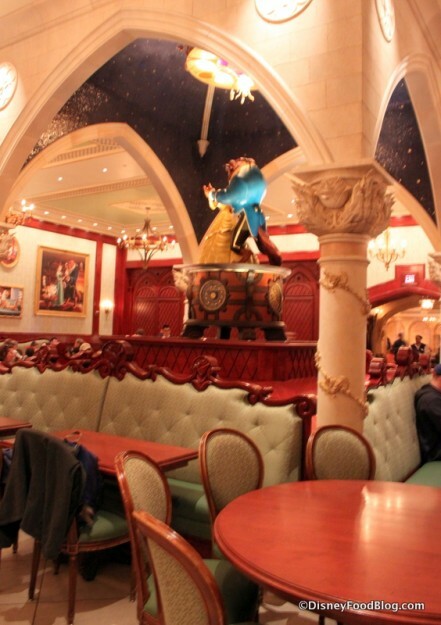 We will be having a Quick Service lunch at Be My Guest in February. I read somewhere that it will cost us two quick service meal credits each for this special lunch. Is this true? Sharon — Be Our Guest breakfast and lunch are both one quick service entitlement each currently, and I know of no plans to change that in 2017. Hi..we are dining here in a couple of weeks. when i order online it says if you are on the ddp that you select a drink and dessert for each guest…im assuming this includes children!? they too get a cupcake ?? 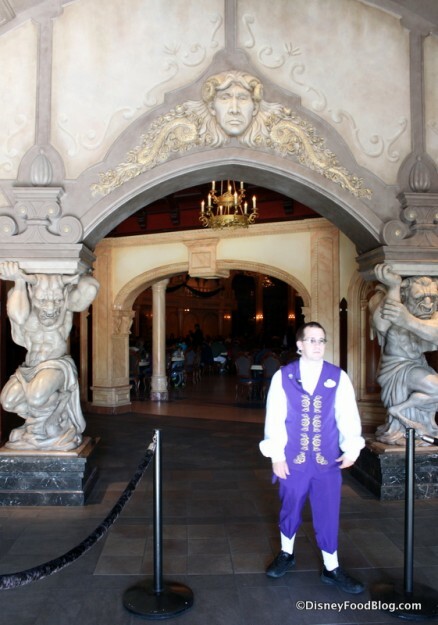 I had little trouble getting an ADR at Be Our Guest. While I didn’t get one at my 180 day window date, I did manage to get one within that same month. However, the restaurants at the Beach Club resort have been a different story. It’s less than a month now until our trip, and I JUST got an ADR for Beaches and Cream and am still trying (five months into this now) to get one for the seafood dinner at Cape May. We ate here for the first time on our last trip and were pretty disappointed. The food took forever to get to us and was cold and not very good. We had reservations for breakfast and dinner another day and I canceled both because I didn’t think I could convince my family to eat there again. At Disney World with 8 year old grandson. He has Type 1 diabetes. Not one restaurant has information about carbs per food item. How sad. 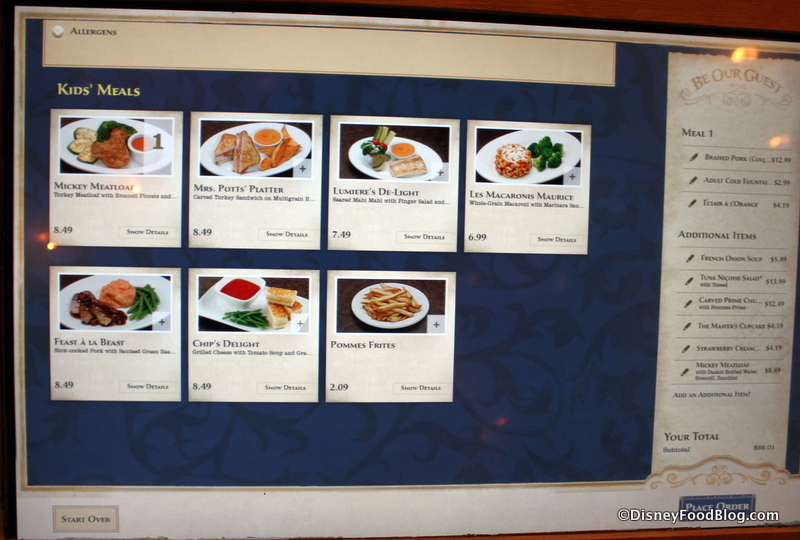 Garret, you might want to contact Disney Dining (special dietary requests page here!) to let them know.